Bridge United Boy's has yet to win in this competition, having lost all 3 games. 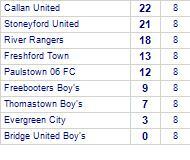 Paulstown 06 FC has yet to be beaten in this competition, having won 2 out of its last 4 games. Freebooters Eagles has yet to win in this competition, having lost all 2 games. Paulstown 06 FC's last fixture played was a straightfoward 6-4 win at home against Thomastown City. Paulstown 06 FC claim victory against Newpark AFC B.
Paulstown 06 FC take spoils against Thomastown City. Thomastown City has yet to win in this competition, having lost all 3 games.